If Google Glass isn't enough to get you worried about technology, how about a device that can see through walls using Wi-Fi? 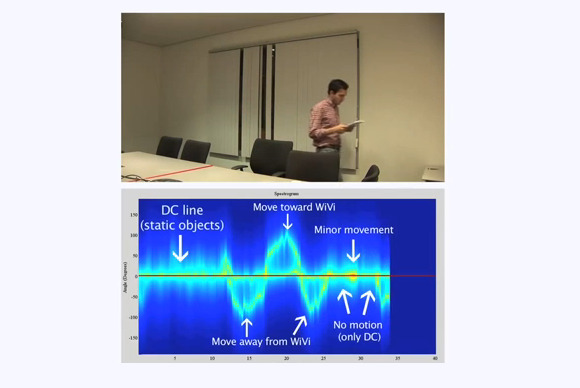 Researchers at MIT are experimenting with a system called Wi-Vi, which they say can track moving objects through walls by using the inexpensive, nearly ubiquitous wireless system. Wi-Vi could be built into a smartphone or a special handheld device and used in search-and-rescue missions and law enforcement, according to Dina Katabi, the MIT professor who developed Wi-Vi along with graduate student Fadel Adib. But Katabi thinks consumers might use Wi-Vi, too. For example, someone walking outdoors at night who thought they were being followed might use it to detect a person behind a fence or around a corner, she said. There's no need to worry about the person in the next hotel room watching you dress, at least not yet. The display has very low resolution today, more like a radar tracking an airplane than an X-ray showing details. The MIT video below above how it looks. But Katabi says she and Adib are working on higher resolution and the system might someday show recognizable faces. Before then, society might want to develop policies around how it could be used. "Like all technologies in the world, it depends on us how we use them," Katabi said. Wi-Vi works by sending Wi-Fi radio waves through a barrier and measuring the way they bounce back. It's similar to the way radar and sonar work, but without the expensive, bulky gear and restricted frequencies that radar requires, according to Katabi. Every time a Wi-Fi signal is reflected off an object, the shape and makeup of that object affects the signal that comes back. But when Wi-Fi hits a wall, most of the signal gets reflected off the wall and only a faint bit of it reflects off the people on the other side. To get around this, Wi-Vi transmits two Wi-Fi signals, one of which is the inverse of the other. When one signal hits a stationary object, the other cancels it out. But because of the way the signals are encoded, they don't cancel each other out for moving objects. That makes the reflections from a moving person visible despite the wall between that person and the Wi-Vi device. Wi-Vi can translate those faint reflections into a real-time display of the person's movements. The key benefits of Wi-Vi over current ways of seeing through walls, such as radar and sonar, are cost, power and size. At the heart of the technology is its encoding scheme, which can be implemented in silicon, Katabi said. Wi-Vi could be built into a cellphone soon, and for not much more than the cost of a regular Wi-Fi module, she said. "All the components we use are ones typically used in a Wi-Fi handheld device," she said. Because of its underlying technology, Wi-Vi also wouldn't represent a big drain on batteries, Katabi said. Bringing wall-penetrating vision to handheld devices could open up a lot more uses for it. Current radar-based systems used in the U.S. military are so big they need to be transported on trucks, Katabi said. Even the Army might need a more portable tool for seeing through walls in certain settings, she said. Wi-Vi's capabilities might also help searchers find people trapped in collapsed buildings after earthquakes. Police could use it to detect the number of people in a room and their movements, preventing an ambush when they raided the room. Used with a gaming console, it could allow players to walk away from the console into another room and keep playing the game, Katabi said. Because of its low resolution, Wi-Vi could actually enhance people's privacy rather than erode it in some cases, Katabi said. For example, it could be used to remotely monitor whether an elderly parent had gotten out of bed or gone into the kitchen, without installing video cameras that the parent might find intrusive. But whether in the hands of police or of ordinary people, a widely available tool to see through walls raises questions that the law hasn't answered, said Hanni Fakhoury, a staff attorney at the Electronic Frontier Foundation. "Your location is something that's worthy of privacy," Fakhoury said. "We know that, even within your house, where you go can reveal a lot about yourself."